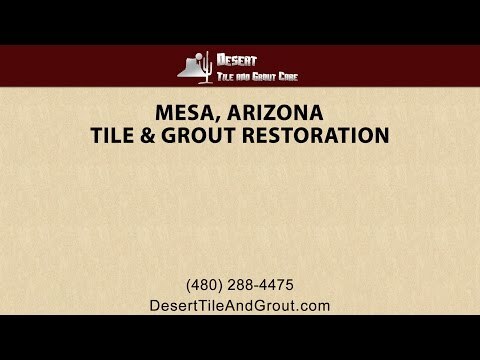 Desert Tile and Grout Care is dedicated to providing quality tile restoration services in Mesa and surrounding cities in the Valley. If your tile is old and you feel that replacing it is the only option available to you, don’t worry! Desert Tile and Grout Care has the solution for you. When your tile builds up dust and dirt over time, tile and grout restoration is a sure fire way to make it look brand new. Turn your old, dingy tile and grout into the beautiful centerpiece of your home. 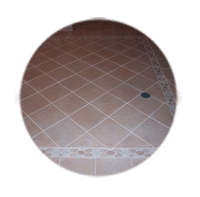 Capable of restoring many different areas of tile in your home, Desert Tile and Grout Care is the perfect solution to restore your tile and grout. When your bathroom tile builds up water scum marks, Desert Tile and Grout Care can take care of it, making it look brand new. Not only do we clean bathroom tile and grout including shower or tub tile cleaning, but we also restore kitchens, walkways, patio and outdoor tile and grout, pool decks, and more. We also clean a variety of different types of tile ranging from ceramic tile and Mexican tiles to brick and stone. Get all of your tile and grout surfaces restored with our kitchen tile cleaning, bathroom tile cleaning, and more. Make sure your tile and grout is looking refreshed and renewed with Desert Tile & Grout Care! Tile is a popular choice in Mesa Arizona; it’s a beautiful yet durable addition to any décor, but some types, like Saltillo Tiles ad a special authenticity to the Spanish and Southwestern style homes favored in this area. Saltillo tiles, which originated in Saltillo, Mexico, are made from natural clay and have a distinctive rustic appearance. Saltillo Mexican tile floors are extremely porous and therefore stains and scuffs easily if not properly sealed and maintained. Another Mexican tile is Mexican Talavera, which are smaller earthenware squares, that are glazed and then hand-painted. These colorful and rustic tiles are often used on countertops and walls. Natural tiles can sometimes develop a problem when minerals from deep inside the clay move to the surface as water in the clay evaporates. This can lead to a white staining called efflorescence, which often requires professional cleaning. Stone is another attractive and durable choice in flooring and countertops. There are countless types and finishes to choose from, though marble, granite, and slate are among the most admired. But all stone floor finishes are porous, and should be properly sealed to prevent stains sinking into the tiles. Ceramic tile in Arizona is an elegant addition, and many of these tiles can last as long as your home. But whether your tile is clay, stone, or ceramic, it must be properly maintained. Dirt can easily adhere to the surface of the tile and grout, leaving it looking dull, discolored, and dirty. Mesa tile should be deep cleaned periodically to eliminate deeply penetrated dirt and stains. 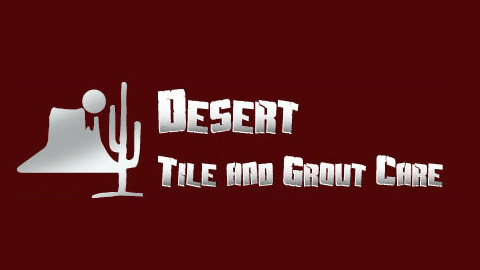 Desert Tile and Grout can meet all of your tile maintenance and restoration needs. We are a family owned & operated business that is fully bonded and insured with over 14 years of experience to our credit. Our professional floor cleaning in Arizona and color sealing of your grout and tile can renew its original beauty while adding a protective seal. Grout often suffers the worst staining, but we can clean and even change the color of your grout to give your room a new look. Color sealing in Mesa can prevent dirt, grime, and moisture from being absorbed into the tile and grout. Mesa has quickly grown to be the third largest city in Arizona, with much to offer, whether you live here or are just visiting. Many visitors and Mesa citizens alike enjoy the Cactus League spring training games that begin in February each year. Mesa is home to Hohokam Stadium, the spring training home of the Chicago Cubs. In all, 15 teams train in the Phoenix metropolitan area, making it the greatest concentration of professional baseball facilities anywhere in the United States. If baseball doesn’t interest you, Mesa retains many attractions reminiscent of its Old West and Native American history, such as The Rockin’ R Ranch, a real pioneer ranch, still operated by one of Arizona’s original pioneer families. Mesa also offers several museums and numerous scenic areas and hiking trails in the nearby mountains. Mesa truly offers something for everyone! Professional cleaning and color sealing of all types of tile and grout. Mesa is a city that attracts many active people. Its many great parks, pools, playgrounds, and desert trails make it a paradise for those who love the out of doors. There is something to do and see for every member of your family. You can go for bike rides, walk the canals, play golf, baseball, softball and so much more. The mild winters make Mesa the perfect outdoor place, all year round. You probably even have family visiting in the winter months trying to escape the cold northern winters. Another reason people love visiting or living in Mesa is the Southwestern culture that still can be observed all over the city. This also includes a heavy use of tile in people’s homes. The Sonoran desert environment and the many dust storms that are prevalent in and around Mesa, make tile an excellent flooring choice as it is easy to clean, long lasting and doesn’t show dirt as much as other flooring options may. However, even the best tile gets dirty eventually. And your grout probably even more so. Desert Tile and Grout Care understands the demands heavy foot traffic, outdoor dirt and desert dust places on your grout. 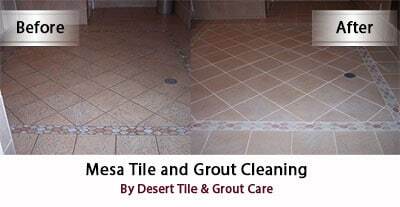 Desert Tile and Grout Care is your Mesa Tile Floor Cleaning Expert that has the tools to bring your grout back to its former beauty. Ceramic Tile is a very popular choice in Mesa homes, because of its many different options as well as its affordability. While the tile itself is pretty much resistant to dirt or can be cleaned more readily, ceramic grout often becomes dirty and unsightly. If it is unsealed grout allows for dirt and spills to penetrate and set in the porous material. Even worse, in your bathroom, unsealed grout can cause mold and mildew to grow. 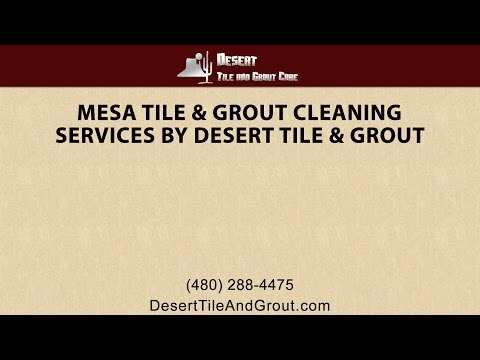 Desert Tile and Grout has the know how and the tools to deep clean your Mesa grout and to remove even stubborn stains. Deep Cleaning your grout to remove set-in stains is a great start, but if you want to prevent new stains from prematurely making your grout look dingy and ugly, consider having it sealed with our penetrating Mesa grout sealer. After the sealing process your grout is protected from future stains or even mildew and mold growth. If you are in the mood for an entire new look, we can also restore your grout and color it before sealing. A newly colored grout will change the appearance of the entire tile floor. You will love the results. Desert Tile and Grout Care provides grout cleaning, restoration, coloring and sealing services to Mesa and surrounding communities. Not only kitchen floors will benefit from having their grout cleaned and sealed. Consider sealing your bathroom or shower tile and grout to protect it from moisture damage. If you have tile counter tops, it can be a great idea to have them cleaned or sealed as well, or if you are bored of the look, change it up with a grout-color. No matter where your ceramic tile grout is in need of cleaning, from living spaces, to decks, patios, hallways or bedrooms, our Mesa Grout Cleaning and Sealing will restore their natural beauty. Contact us today for more information or to set up an appointment for your grout cleaning. Mesa is one of the largest cities in Arizona, and it is home to notable attractions like HoHoKam Park (where the Chicago Cubs have their spring training), the Mesa Grande Ruins, and a number of historical properties. Many of the beautiful buildings throughout the city feature tile – on the floor, on the roof and even on the walls. Tile holds up well against the extreme heat in the summer, and it creates a nice look. Though tile is also very easy to clean and maintain, over time, it can become stained. The tile itself can become dull and faded, and the grout lines can become dark and dirty. Restoring the tile to its former beauty takes a special touch. 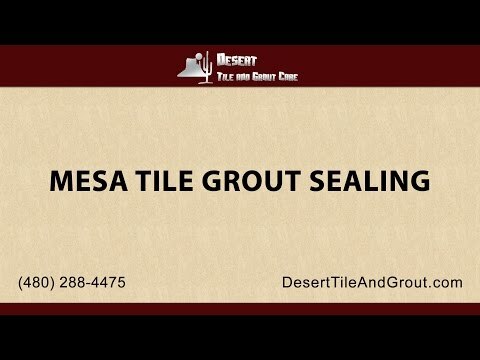 Desert Tile and Grout Care offers professional Mesa tile cleaning and grout cleaning to help you protect the tile and improve the look of the space. We specialize in rejuventating and restoring ceramic tile, brick and stone in homes and businesses. We use special, professional-grade cleaners and expert techniques to get the results that you can’t get at home. With our professional cleaning, we can give your space an instant facelift. You’ll feel like you’re looking at entirely new tile. Professional cleaning can take years of dirt off brick, tile and stone. You may be surprised to see what is lying beneath that layer of grime. You may not even remember what the original tile looked like. Getting professional tile cleaning can help you save thousands on putting down new tile. Our Arizona professional tile cleaning company has been offering tile cleaning and grout cleaning in Mesa and the surrounding area for many years. We have the experience and the training to get the results you need. Call us today to find out how we can help you to rejuvenate your brick, tile or stone.